The Englesrufer sound balls are designed to fit inside an Angel Whisperer pendant. The crystal sound balls add sparkle to your Angel Whisperer with high quality designs in Swarovski Crystal. Each sound ball has its own distinctive and individual jingle which is designed to call different guardian angels. Select your sound ball depending on what assistance you need that day and call your angel to your side. 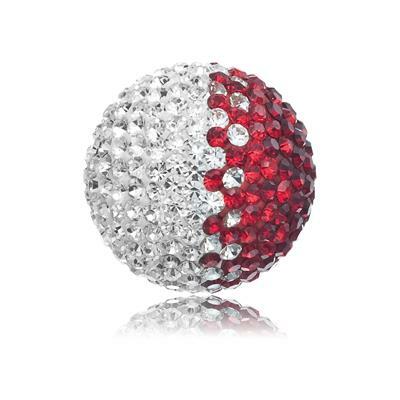 This Englesrufer Red and White Crystal Sound Ball Large is adorned with sparkling red and white Swarovski crystals. The perfect addition to an Angel Whisperer pendant, or an excellent gift for someone special. The Sound Ball is made from Brass, and is set with red and white Swarovski Crystals.